I cannot contain my emotion about this bag!! It has absolutely everything I love: it’s HUGE, it’s Fair Trade, it’s one of a kind and it’s bohemian looking! What else could I ask for?? I’ve always been a huge fan of huge bags… the bigger the better, in my opinion. I need all the space to take everything I want with me. Now I don’t really see myself carrying a tiny bag – unless it’s to go out at night – so much so that I don’t think it’s really my style. 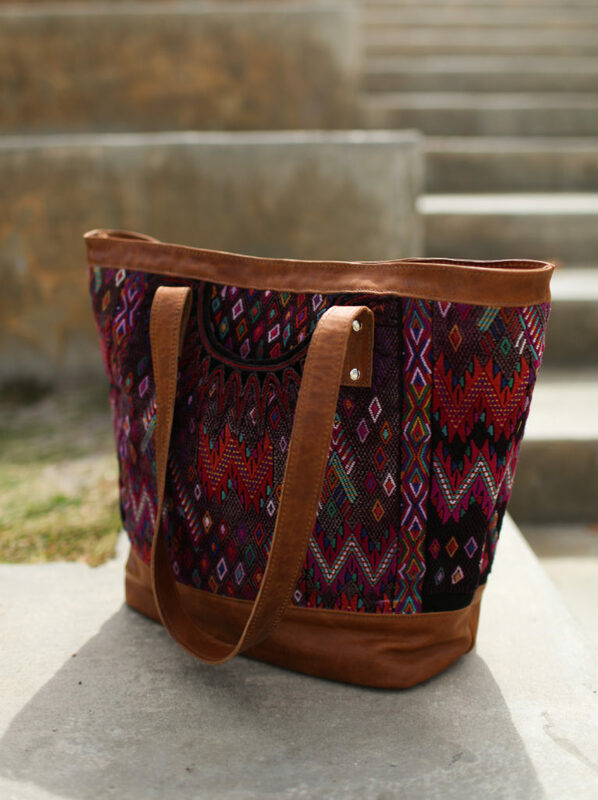 The second reason… and one of the most important ones… is that this amazing bag is fair trade! For those of you who have been following me for a while know that I decided to shop more fair trade brands and less fast fashion. Read this post to find out why. Some people think that it’s hard to find cute fair trade items… and that’s so not true! Every bag is handmade by artisans and the loom and fabric from one bag is different from the other bags, which is so wonderful because, as I told you in my last post, I have a thing about buying pieces that are a bit different and one of a kind. 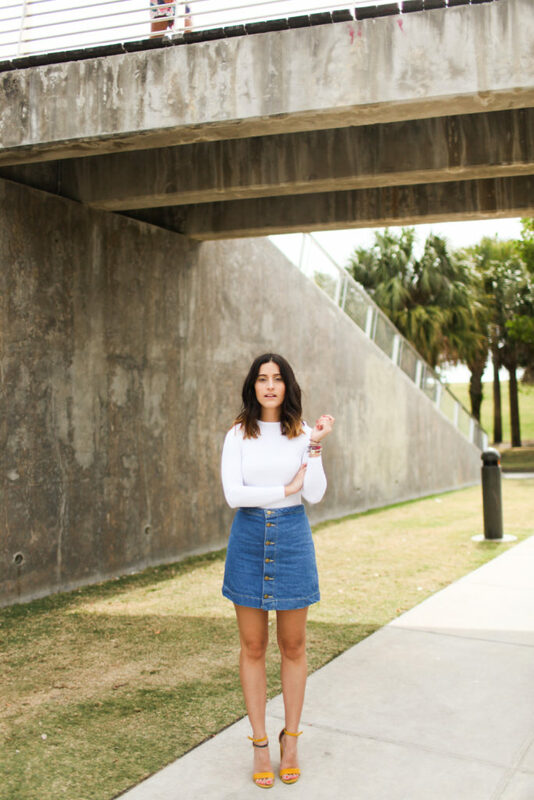 I always say that I have an eclectic style… and I have a super soft spot for bohemian pieces, which I incorporate into edgier and more classic outfits. 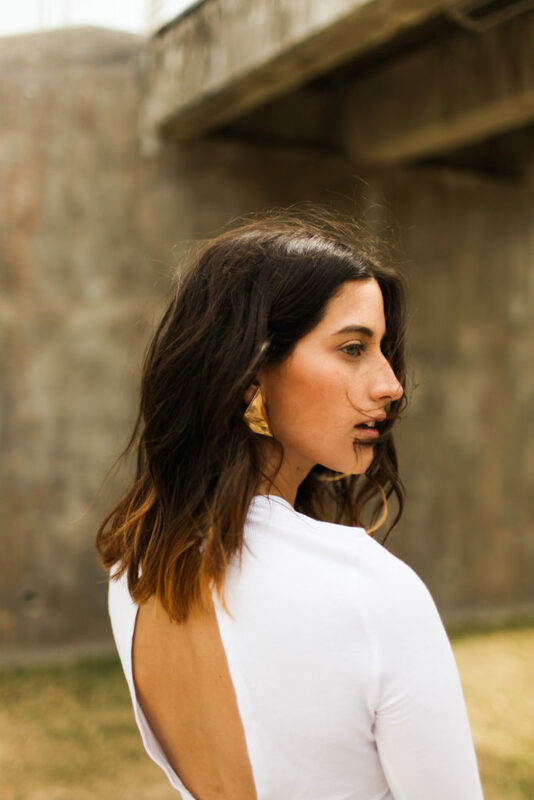 I’ve been following Nena & Co. for many years now, and the first thing that I followed them for was their bohemian style and vibe. Then, when I decided to go through the fair trade route… I feel much more in love with them than ever. I want you to discover and fall in love with Nena & Co. as much as I do, which is why you have to stay tuned to my Instagram because I’ll be doing a giveaway on Monday!! No puedo contener la emoción que tengo por esta cartera!! Es que tiene todo lo que yo amo: es INMENSA, es fair trade (o intercambio justo), es única y es súper bohemia! Qué más puedo pedir?? Siempre he sido muy fan de las carteras grandes… mientras más grande mejor, en mi opinión. Tengo que tener todo el espacio necesario para llevar todo lo que quiero. No me veo usando una cartera pequeña – a menos que sea para salir de noche – tanto así que no considero que sean mi estilo. La segunda razón… y una de las más importantes… es que esta cartera es fair trade! Los que me han seguido por un tiempo saben que hace un tiempo decidí comprar más cosas fair trade y menos cosas fast fashion (moda rápida). Lee este post para saber porque. Algunas personas piensan que es difícil conseguir cosas lindas que sean fair trade y eso es totalmente mentira! Cada cartera está hecha por artesanos y las telas de cada cartera es distinta a la de las otras, lo que es maravilloso porque, como les comenté en mi post anterior, tengo una cosa con comprar piezas que sean únicas y diferentes. Siempre digo que tengo un estilo ecléctico… y le tengo mucho cariño a las cosas bohemias, las cuales incorporo a looks más clásicos o arriesgados. He seguido a Nena & Co. por muchísimos años y una de las razones principales por cuales los seguí fue por ese look bohemio. Cuando decidí irme por la ruta del fair trade… la marca me encantó muchísimo más de lo que ya me gustaba. Quiero que descubras y ames a Nena & Co. tanto como yo lo hago, por lo cual quiero que estes súper pendiente de mi Instagram porque estaré haciendo un sorteo este lunes!! Tote Bag / Cartera: Nena & Co. This blog title though!!! 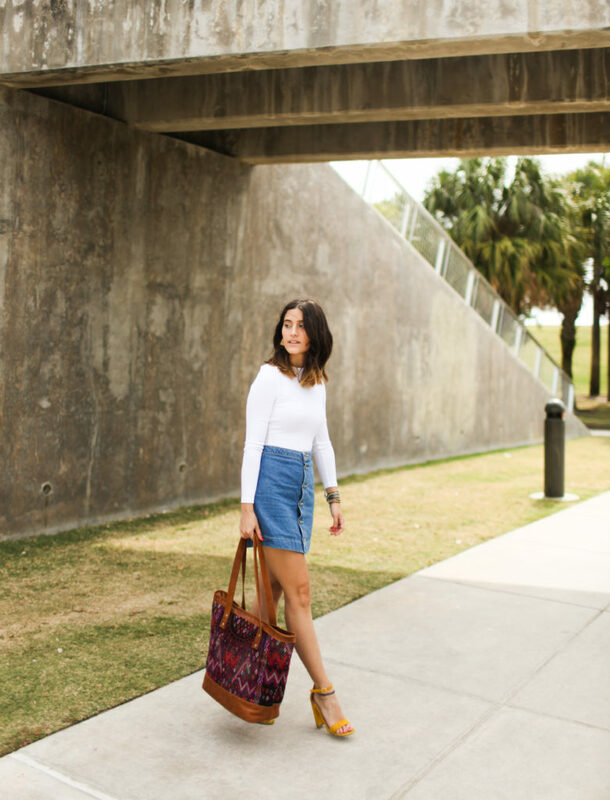 I really love how you styled this tote – perfection! 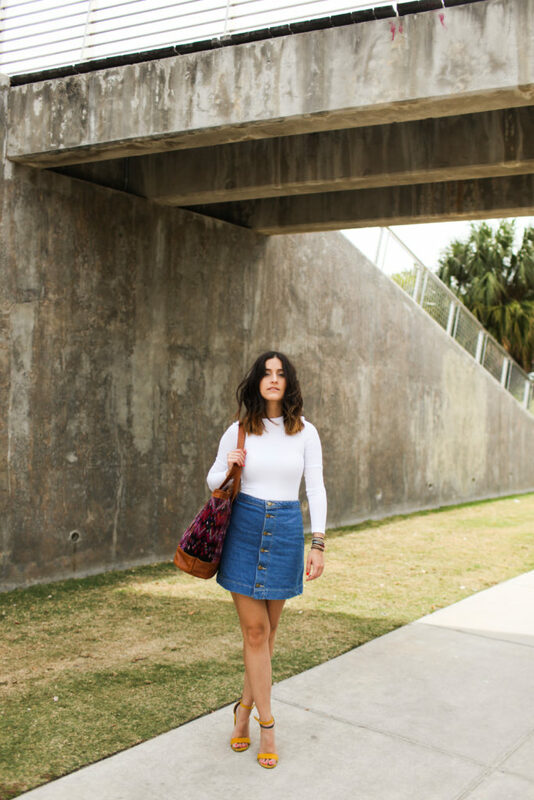 This bag is awesome and I’m dying over this skirt! Those yellow heels are amazing! Love the contrast they provide with your colorful bag! That bag is awesome! Love the pattern and how colorful it is! I adore this classic look! You look SO pretty!!! I’m usually not one for big bags, but I really love the aesthetic of this one! Super boho chic. Great find! big bags are the best!! Oh this outfit is too cute! Love this tote & those bright heels are so fun! I love this classic look paired with an amazing bag!! Big bags are a problem of mine… I can’t get enough!! 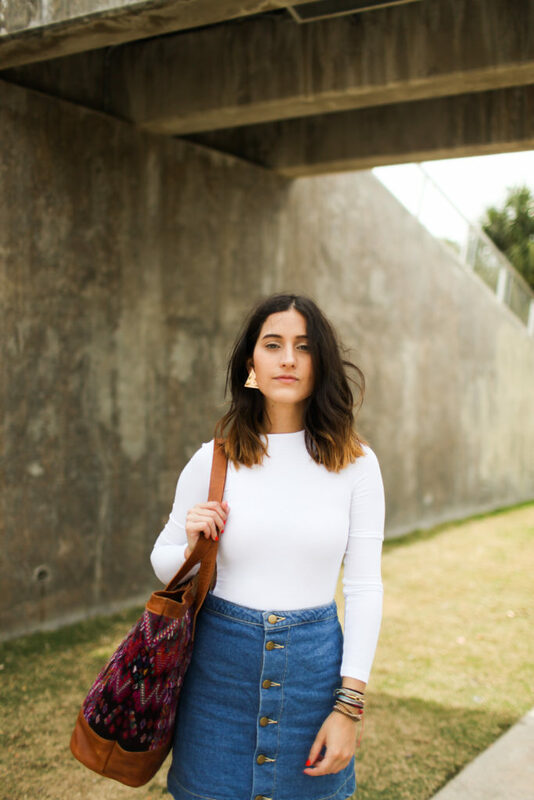 This is such a perfect summer/fall transition outfit! I love a big bag too! 100% my favorite! This gorgeous bag works perfectly with your super cute outfit! And, I love your sandals!!! Totally agree! 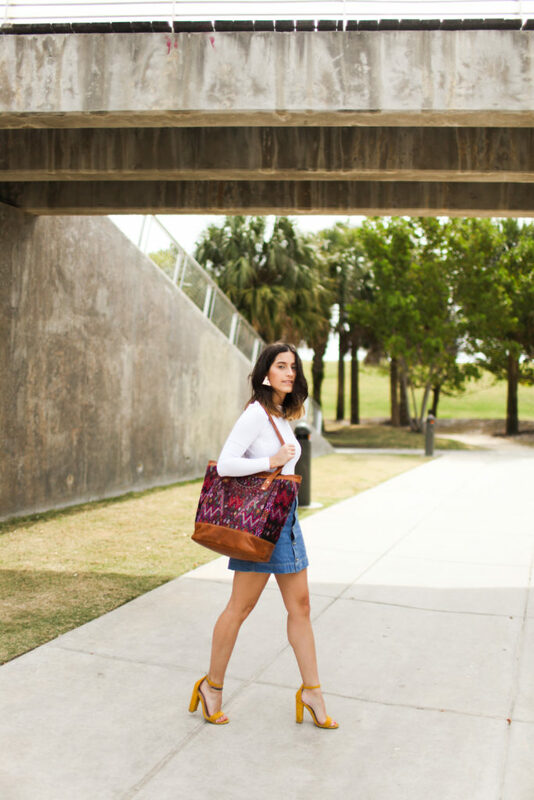 I love big bags too…so perfect for travel and life on the go! You are gorgeous in that cute skirt with those heels. Killin it, girl! I am a huge fan of big bags myself! Very cute one! I’m totally with you girl, I LOVE big bags and this one is amazing! I love this bag but seriously this ENTIRE LOOK is perfection! I’m the biggest fan of big bags too! Plenty of space to pack what I need, and more!